1 of 1 Bring 6 cups water to a boil. Add 8 oz snow peas and 1 each diced sweet red and yellow pepper and cook 1 minute. 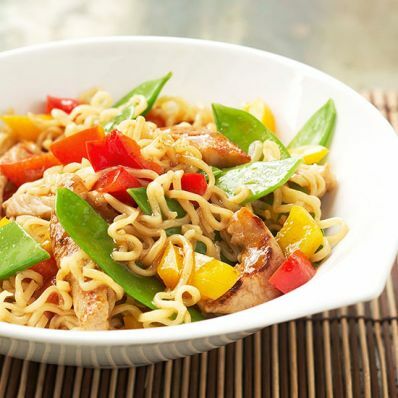 Add 2 packages chicken-flavored ramen noodles; cook 2 minutes. Add 3/4 lb sauteed chicken strips (thawed if frozen), 1 of the noodle flavor packets, 3 tbsp ponzu or soy sauce and 1/4 tsp red pepper flakes. Cook 2 minutes. Sprinkle with 2 sliced scallions.